Today was a very pleasant day, flat, little traffic easy to get and stay rolling. A nice day for socializing. Scenery was very Ohio-ish. Sunny, pleasant, no wind 57 degrees to start warming up to a pleasant 80 degrees upon our arrival. 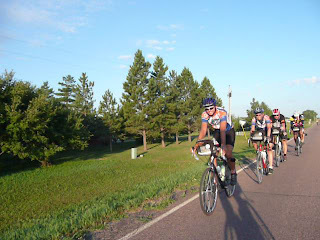 It is at this point in the ride that our leader Mike Munk says that the casualties start to roll in. Alphonso road today, but sat on his left leg while he peddled (ouch). Jan Smith of Tucson took the day off and is planning to take the next three off based on her doctor’s orders (skin off the pelvic floor). John Hubert made the ride with a very large ace bandage around is left quad and road extremely gingerly. Not really a lot to report today. It was kind of like rolling through rural Ohio. Corn fields, soy beans, a little moisture in the air. It appears that we have left the desolate west behind now. We rolled out slowly after a nice buffet breakfast, about our standard affair. Not a lot of navigating or traffic to deal with. #1 son Mike Miller leads the four Millers, mom keeps all in line. The road was extremely flat and pretty bumpy. Bob Frame was kind enough to spend most of the day riding with me and keeping me company. He’s a strong rider from Georgia who made a big commitment a year ago to loose weight and radically improve his health through cycling and new good habits. It looks like it is working for him. It was fun spending time getting to know Bob. He was a very good listener and an interesting person. Mom today I felt like the highlight of the trip was the food. We had lunch at a barbecue spot that was fun and really good. They even gave us a free home made bread pudding desert. 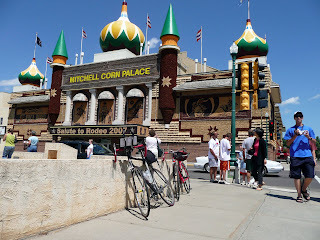 After we got back from lunch and showered, we went to the main attraction in Mitchell, SD… The Corn Palace. A true tribute to American ingenuity and marketing genius. They say 500,000 people from all over the world visit it annually. 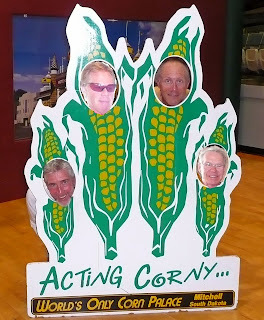 30,000 ears of corn are used to decorate it afresh every year! They don’t charge admission and the place is truly unique. I wouldn’t recommend driving across country just to see this, but if you ever have to spend a night in Mitchell and you don’t have anything else to do, you definitely want to do a drive by. 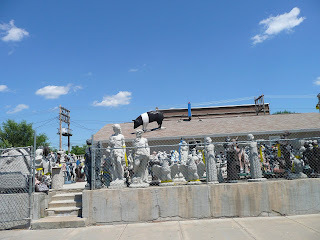 Cindy, how about a pig for on top of our roof? What an adventure you are having! We just caught up with your blogs (loved the YouTubes in a couple of them). Can't believe that you are more than halfway across America now. We'll follow you more closely now. Ride on! Thanks for the info about the zoning violation, I will give the pig to my mom for Christmas, she lives in Grandview where the laws may not be as strict! Is it just pigs that are a violation? How about a cow or goat? I really like the way it looks in the photo. It would be so easy to give directions to our house! Thanks for thinking of me honey. Miss you.